Students make up to 6 Tiny Trees in this fun 1 day class. 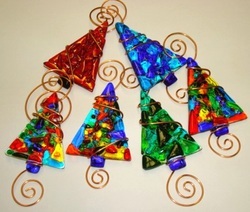 Jennifer will demonstrate how to do wire wrapping, but this is not part of class. Students may purchase wire, beads, bells and stringing material to finish as suggestion in photo.